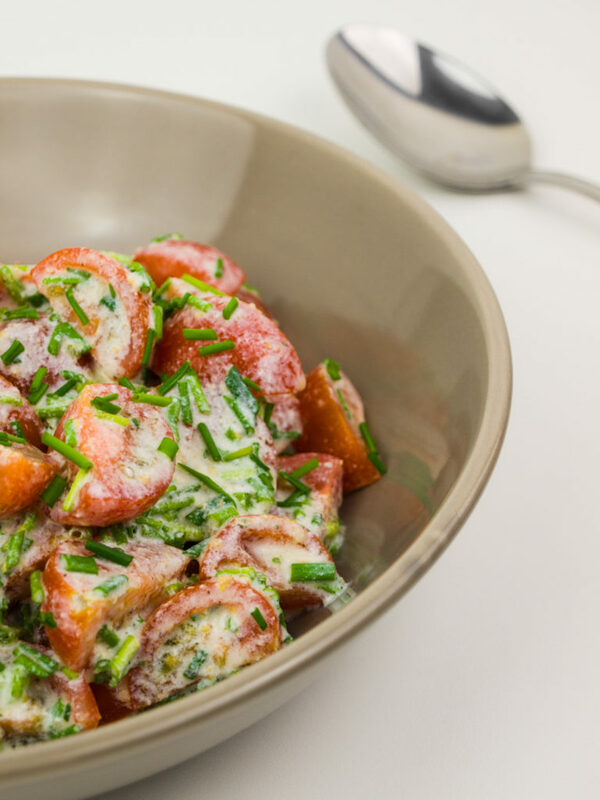 Summery tomato salad with healthy velvety dressing! Some weeks ago I encountered my new favorite tomato dressing of all times! It gives tomatoes a summery light twist while being super healthy at the same time. And while it’s clearly not summer anymore, this little salad might just bring some of those sunny day memories back! The main ingredient in your dressing is regular old milk. But then the liquid milk turns into a delicious velvety dressing with the help of a little vinegar. Once you mix the vinegar into the milk it will start to thicken and separate slightly. You are basically making homemade buttermilk here! So if you are ever in need of buttermilk but have none in the fridge, here’s your emergency quick fix! To spice up your salad properly your best way forward is using a pestle and mortar. If you don’t have these utensils at home you will need to use some pre-ground mustard. Grinding it up together with the other spices gives you a way better flavor though and makes sure your dressing is more evenly seasoned. Even though the recipe calls for cherry tomatoes, all tomatoes will do. Keep in mind that cherry tomatoes are a bit sweeter than regular tomatoes. If you are using regular ol’ tomatoes, you might want to add another half teaspoon of sugar. Let’s make a delicious dressing and get that summer feeling back! Sweet little cherry tomatoes covered by a healthy summery low-fat dressing! The chives give them a little zing! Turn regular milk into an extraordinary tomato dressing! Combine milk with the vinegar, give a good stir and let stand for 5 minutes. The milk will curdle into a yoghurt-like consistency. Don’t be alarmed, this is exactly what you want! Meanwhile, put the mustard seeds, tarragon, sugar, salt and pepper in a mortar and use the pestle to crush it into a very fine dust-like powder. Add the spice mix to the milk and whisky until well combined. Halve or quarter the cherry tomatoes, depending on their size. Chop the chives into fine rings. Right before serving, mix the tomatoes with the dressing. Taste and adjust the seasoning with a little extra sugar, salt or pepper if necessary. Garnish your salad with some more chopped chives and dig in! Have you ever made buttermilk like this before? Did you enjoy the slight aniseed taste from the tarragon combined with the spiciness of the mustard and the sweetness from the crushed sugar? If you have any suggestions on the dressing let us know in the comments below and help to make this dish even better!